The Washington Interscholastic Athletic Association (WIAA) will meet on Jan. 28 to vote on amendments to its operating charter. The outcome of those votes could have a wide-ranging and potentially dramatic impact on high school sports in Eastern Washington. Of the 12 amendments proposed this year, two of them have to do with amending how the WIAA classifies schools. The first amendment proposes drawing hard-line parameters for enrollment numbers within the six classifications. The second would allow for schools to reduce their classification numbers based upon the percentage of student enrollment eligible for free and reduced-priced lunches. “We have learned, for some time, that classifying schools by enrollment only just doesn’t work,” said Greater Spokane League/District 8 director Herb Rotchford, part of the group that developed the proposals. Based on historical data and population distribution, the committee established these boundaries in the enrollment proposal: 4A: 1,300 and up; 3A: 900-1,299; 2A: 450- 899; 1A: 225-449; 2B: 105-224; 1B: 104 and below. Currently, each of the six classifications have roughly the same number of member schools: around 64 per class, taking into consideration opt-ups and other factors. Under the new proposal there will likely be an imbalance, affecting the number of potential state playoff berths. Schools will still be allowed to opt up, but – unlike current policy – schools near the bottom of the classification range would not be “pushed down” to the next classification merely to retain even numbers in each of the classes. That means for the next cycle, certain classifications could receive 16 berths to a state tournament (or more, potentially) while another might receive fewer. It seems certain the WIAA will maintain its 4-1 ratio of number of schools in classification per state berth. The second proposal tries to address competitive inequity. The proposal would allow a school that has a minimum of 10 percent over the state average for free and reduced-priced lunches (currently 43 percent) to lower its enrollment number for classification by that amount. A part of the original proposal would have seen schools below the average add to their classification enrollment number, but that amendment received a lot of pushback from some of the private and more affluent schools on the West Side. Private schools don’t have free and reduced-priced lunches per federal public school guidelines. 4A: Central Valley, Ferris, Gonzaga Prep (opt-up), Lewis and Clark, University. 3A: Cheney, Mead, Mt. Spokane. 2A: Clarkston, Deer Park, East Valley, North Central, Pullman, Rogers, Shadle Park, West Valley. When Ridgeline comes online in 2021, that could further impact the classification for the following cycle, with the new high school and the other two Central Valley school district schools, CV and University, all meeting the 3A threshold. Another amendment could allow for a school to petition to play down in football only. Part of the petition would be securing the support of the current and new leagues for the move. The impact of the two votes on the area leagues and teams could be drastic, but the GSL is taking steps to address competitive balance among its members already. According to Rotchford, the GSL is moving forward next season with a football schedule that will not require 3A schools Rogers and North Central – two likely candidates to play down a classification due to the free/reduced-priced lunch adjustment – to play a full schedule against the 4A schools. It’s a one-year schedule in advance of the new classifications that may require 4A schools to find a nonleague opponent or even have a bye week next season. North Central and Rogers would play each other twice. 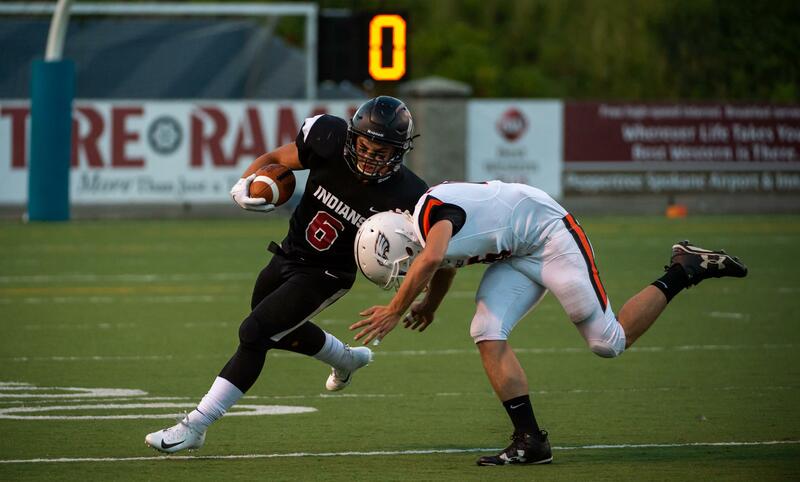 NC didn’t win a football game against a GSL opponent last season and Rogers had one win – against North Central. NC is a combined 6-32 the past four seasons with two league wins – both over Rogers, which is 3-34 in the same span. Rogers girls basketball is being outscored by an average of almost 48 points per night in league play this season. If those two schools, along with Shadle Park, get the option to play down due to the socioeconomic measure, the GSL will have to consider options on how the league is structured. With the new Liberty Lake high school, Ridgeline, slated to open in 2021 and scheduled to support more than 1,600 students, it could start out at 3A/2A but potentially join the 4A ranks. If Mead drops a classification to 3A, that might require Spokane’s remaining 4A schools to look to the Mid-Columbia Conference to find enough regular-season games in their classification. Currently, the GSL combines with the MCC for District 8 playoffs for berths to state, while the Great Northern League qualifiers face teams from the Central Washington Athletic Conference in crossover games to determine state seeds. Depending on how the classifications sort out, the number of state berths from Eastern Washington could dramatically change as well. And if the socioeconomic measure passes, the CWAC could face plenty of change in its own right with as many as six teams playing down, potentially affecting the number of 2A teams in the eastern half of the state and glutting the 1A or 2B level. The WIAA wants to ensure a level playing field, but right now there are more questions than answers. Once thing is for certain: Changes are coming and some traditional rivalries or alignments could change or end – some for better, some maybe for worse.